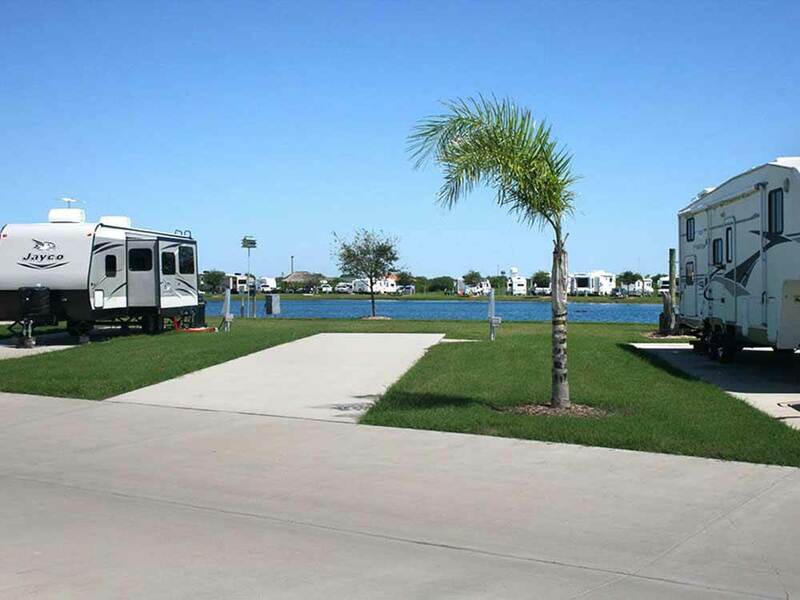 Come stay a day, a week, or months at our beautifully landscaped RV resort. Large RV sites surround our fishing lake. Enjoy relaxing in our clubhouse, by the pool, or on the fishing dock. Tight park layout limits patrons' ability to safely navigate RV sites without penalties for rutting off-concrete areas. Vehicles parked across from my site extended into roadway upon arrival and departure compounding congestion. Thankfully residents of these sites were home and agreed to move vehicles to avoid conflicts. Rules prohibit using adjacent grassed areas for usual RVing items like chairs, tables, BBQs and such. Patrons are restricted to concrete areas leaving no area for outside use without penalties Our party kept looking over our shoulder for park police handing out tickets - Luckily none showed up. Typical RV parks provide picnic tables. Additional adjacent space would make for a more enjoyable patrons' stay. This place is not a resort its a parking lot. we were giving a site that only had 5 feet of grass outside of the door of our rv before looking at a parking lot for other cars. The site did not even have a picnic table only the premier sites have picnic tables. All of the sites are very close to each other with very little space to enjoy your stay. this was to be our 4th of July get away. when we went back to the office and told them we did like the site and wanted to cancel the stay they were rude and would not do any kind of refund because of the holiday weekend this was on the June 30th. After being talked down to by the office manger we left and stayed at another place down the road, Please don't stay here for any reason. We just couldn't allow anyone to pass up this RV resort when passing through the South Texas area. Although we have not been RV-ing for a long time yet, this resort was everything we had hoped for. Clean, well designed, well managed, great spaces, amenities, and good location. If they could have just made it a little cooler during our stay it would have been perfect! After picking up our new travel trailer we were very excited to have our first RV experience. After spending three nights in this park we were exceptionally pleased. The staff were very friendly, helpful, and courteous. Spaces were neat and roomy concrete pads. The full hookups were excellent. The lake, pool, restrooms and other facilities were well designed and maintained. The park location makes shopping in Port Lavaca and Victoria very convenient. We are staying here booked it for a week sure glad we found this place. They are still under construction for some new sites but it is a wonderful place. Great place for our dogs and the facilities are top notch truly a great place. 1st true 10's I've seen on GS. Congrats TL RV Park, really enjoyed the stay, all marks were right on. Wish GS's could be as accurate on all their ratings.